For years Steve Spurrier was the "Coach You Love to Hate" in the Southeastern Conference. His teams would beat you, and he would rub your nose in it. He would gloat about his prowess. He was cocky and arrogant. But he was also very good at his profession. Love him or hate him, you had to give him that. Now we have Vanderbilt's James Franklin auditioning for Spurrier's roll He's getting the "Love to Hate" part down very well, but it's the other part he's sorely lacking in. To be more specific, he hasn't beaten anyone. He's arrogant and cocky, but he hasn't beaten anyone. He's a jerk, but he hasn't beaten anyone . He is fast becoming the new "Coach You Love to Hate" in the SEC, and he hasn't even beaten anyone. 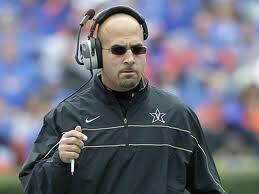 But then again it's Vandy, so go figure. NCAA Football: Why Not an Early Signing Period?